The Kresge Foundation’s Environment and Health programs are pleased to announce a new funding opportunity through its Climate Change, Health & Equity Initiative (CCHE). Applications are due March 19, 2019 by 11:59 p.m. EST. The CCHE community-based strategy is one of three distinct but aligned strategies within the initiative that aims to mobilize a strong constituency for equitable climate action within health care institutions, among health practitioners and among community-based advocates. Kresge has partnered with The Institute for Sustainable Communities, which will serve as the National Program Office, to help manage implementation of the planning phase of the CCHE community-based strategy. 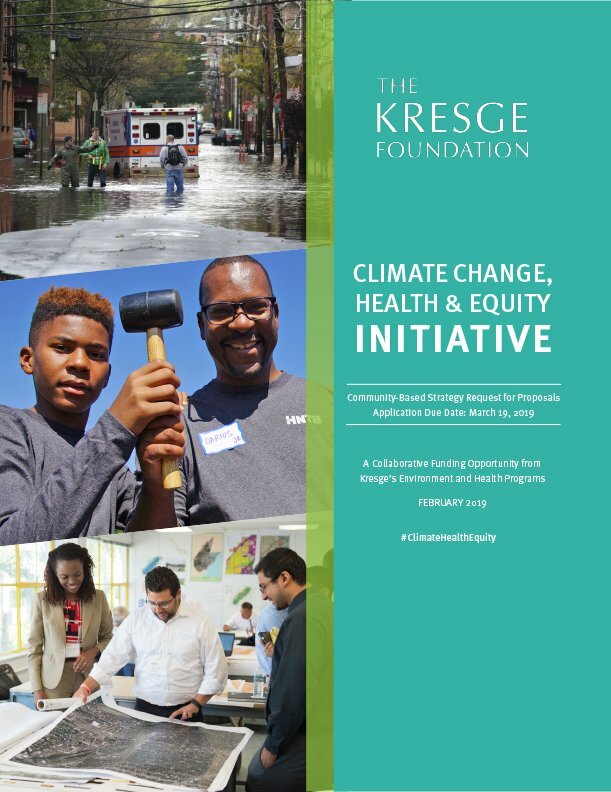 To learn more and view the Climate Change, Health & Equity Application Guide visit https://kresge.org/library/request-proposals-community-based-climate-change-health-equity-strategy. Please also share this opportunity with your partners and networks. An informational webinar will be held on Wednesday, February, 20, 2019 from 1:00-3:00 p.m. Eastern Standard Time. Click here to register for the webinar.